The Samsung Galaxy S II Epic 4G Touch is the latest flagship Android device available from Sprint. With its massive display, thin(ish) profile, speedy performance, and powerful media capabilities, there's a lot to like. 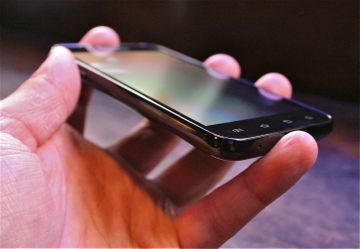 Did Samsung and Sprint manage to get everything right with the Galaxy S II Epic 4G Touch? Phone Scoop digs deep. Sprint today announced the Samsung Epic 4G Touch, the first Galaxy S II phone to launch with a major US carrier. The phone sports a massive 4.52-inch Super AMOLED Plus display and the Samsung Exynos 1.2-GHz dual-core processor. The phone uses a 1.2ghz dual core processor, not 1.0ghz like the reviewer states. Also, many of the Sprint apps CAN be uninstalled. Sprint has listened to the customers complaining about unneeded bloatware and they have provided the option to be able to uninstall many of the apps that are included in the phone. Also, there is no way this phone can be called heavy when at 4.60 oz is is much lighter than many other smartphones on the market.... perhaps lighter than 70 percent of the smartphones on the market. ie. Iphone 4, Evo 3D, Photon, Droid Bionic, etc. The app *data* can be removed, but the bloatware icon in the menu cannot be removed. As far as I am concerned, if I still have to stare at the icon in my app tray, the app is still there. The LG Marquee is less than four ounces, so yes, compared to the lighter phones on the market, this feels heavier, because it is heavier. Well, here is my scoop. I have never had an android and i refuse to promote or buy an iphone like the masses. i have had sprint forever and i enjoyed the lower price i get. now sprint has cracked down on the discounts, it no longer is cheaper. so i decided to either keep the plan and upgrade or just cancel my cell phone service and call it a day. ...so i now own a new samsung galaxy s2 epic 4G cell phone. since this is my first android experience i thought i would just get the best available from sprint. i personally hate large phones. it reminds of the old brick phones back in the 80's and 90's. You really think so? Played with one this morning & it feels like its a feather compared to my EVOs I've had. I don't have an EVO on hand. It is a brick compared to other Galaxy S II phones, though. Signal & phone call quality is my priority. How does this phone compare to the Motorola Photon 4g, which you said was the best 3g phone you've ever tested on Sprint's network?